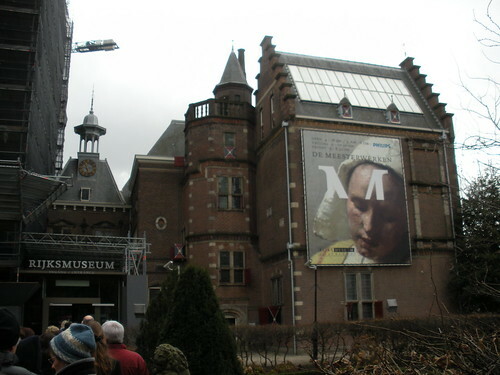 While PJ and I were in Amsterdam last month, we visited the Rijksmuseum, one of the world’s great museums. The museum’s main building is being renovated, so only small portion of the collection is available for exhibition. 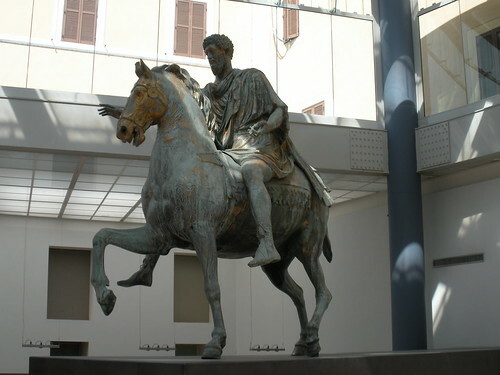 What the museum has done, therefore, is put together many if its masterpieces and put them on display in the Philips Wing of the museum. While it would have been nice to see more, seeing these masterpieces were well worth the visit. We arrived at the museum shortly after it opened, which meant that the line wasn’t too long. We probably only waited in line about 15 or 20 minutes to get our tickets. It was a chilly, wet day, so we were both glad that it didn’t take long to get out of the weather and into the museum. 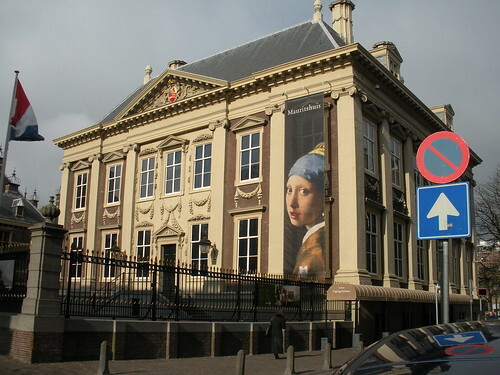 While I was in Leiden recently, I took the train down to the Hague so that I could visit Mauritshuis, the Royal Picture Gallery. 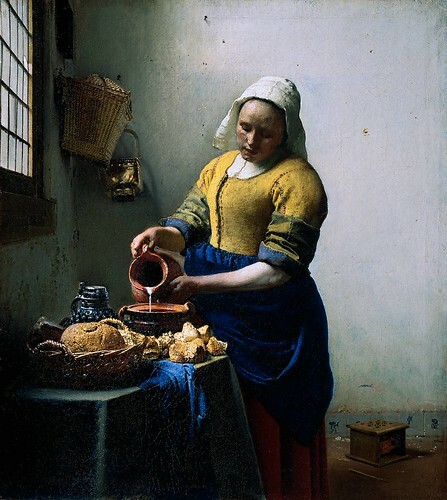 With paintings by Vermeer, Rembrandt, and many others, this museum houses one of the great art collections in the world. The building was originally a seventeenth-century palace, the home of Count Johan Maurits, who was governor of the Dutch colony in Brazil from 1636 to 1644. While he was governing the colony, he had this house built. 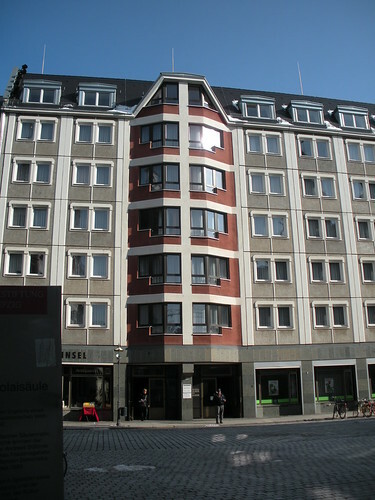 When he returned to the Netherlands in 1644, he took up residence here (at least on a part-time basis). After his death, the house passed on to his descendants. Eventually it became the property of the state. In 1822, the royal collection of paintings took up residence here, where they have hung ever since. 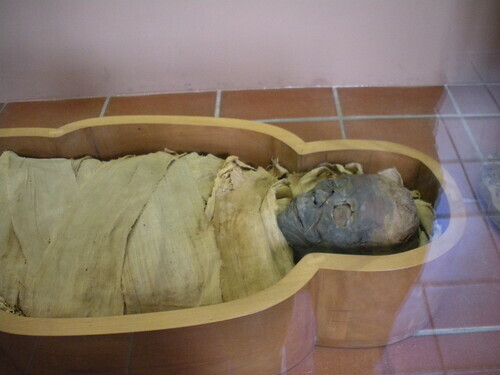 During my visit, one of the museum’s floors was closed to visitors, but the main masterpieces were all still on display. The price of admission also paid for an audio-tour, which was very informative. Usually, I get bored with such tours fairly quickly, but this one was interesting. I thought that all of the information it provided helped me appreciate the art more; I also liked that it gave you the option to learn more or move on after the initial discussion of each painting. Last week, I spent three days in Leipzig, Germany. My university has a long-standing relationship with the University of Leipzig, and I was sent by our Office of Education Abroad to learn more about the program that currently exists and to see if we can find ways to interest more of my college’s students to participate. I think my apartment was the one right above where person on the right is standing. It’s been nearly a year since I had a hottie of the month, my tongue-in-cheek homage to men and women from the long eighteenth century. The lack of “hotties” has largely been due to the fact that I haven’t been teaching (or even researching) in the eighteenth century lately. Now that I’m a dean, I’m not teaching as much, on the one hand, and I don’t have much time for writing, on the other. But I think it’s time to get back to my blogging roots. When I started this blog, it was mostly about my teaching and research. Over time it’s become more pop culture centered. While I’m still going to write about movies, music, and other random aspects of my life and opinions, I also want to write about eighteenth-century subjects. So, I’ve decided to revive the hottie of the month feature! 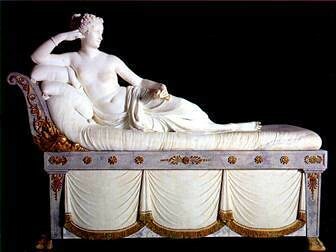 As this image suggests, Canova’s ability to suggest drapery in this statue is amazing. It’s even better in person. The cushion she’s sitting on and the “fabric” on the side of the piece both make you feel like you could reach out and feel their softness. The last part of our trip to Italy earlier this summer was to Venice. I guess it goes without saying that Venice is unlike any other place I’ve ever been. This is the only place I’ve ever visited that had absolutely no automobiles. You get where you’re going either by walking or by boat. It’s totally foreign to everything I’ve ever experienced as an American. 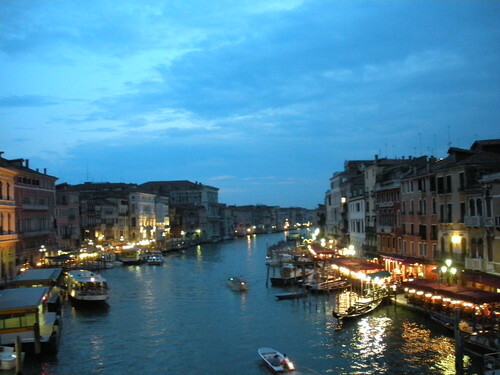 Ultimately, I have to say that I loved it, but the Venice part of our trip was complicated by two significant factors. First, I was exhausted. We had already been walking a lot for more than a week by the time we arrived in Venice. In that regard, I was pretty much over this vacation. My feet hurt, my legs were tired, and I just wanted to go home. More importantly, on the second day we were there was got a message from our house sitter that one of our cats was severely ill and might be dying. Not a great way to end a vacation. Again, I just wanted to go home. Despite these obstacles, we decided to persevere and try to enjoy ourselves. We couldn’t get home early, there was nothing we could do to help Marlowe until we got back to the states, and you never know if you’re ever going to have the opportunity to visit a place like Venice again, so we decided to walk more slowly and just try to forget our troubles. It didn’t entirely work, and we both spent time crying over what might be awaiting us when we got home, but ultimately I couldn’t help but love Venice. 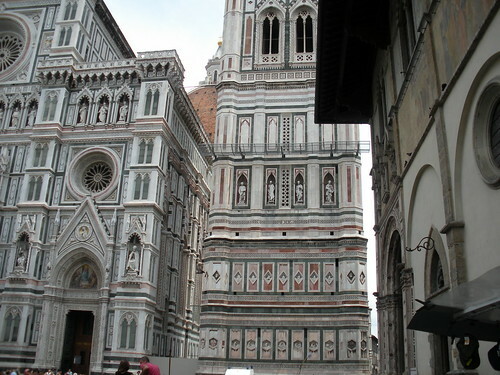 One of my favorite parts of our time in Florence last month was visit to the Duomo Museum, a museum created to house the Duomo‘s artwork, much of which was originally on the outside of the church and therefore exposed to the elements. 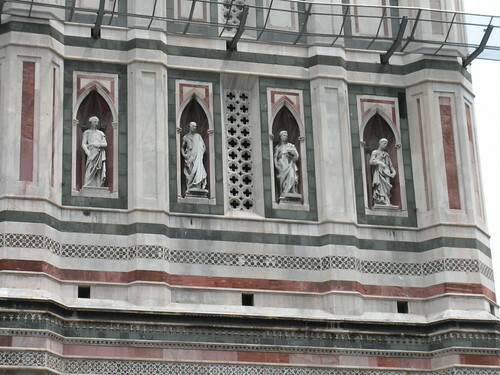 The originals of these statues, along with some exterior doors and other objects from the Duomo, have been moved into the Duomo Museum, which is behind and across the street from the church. 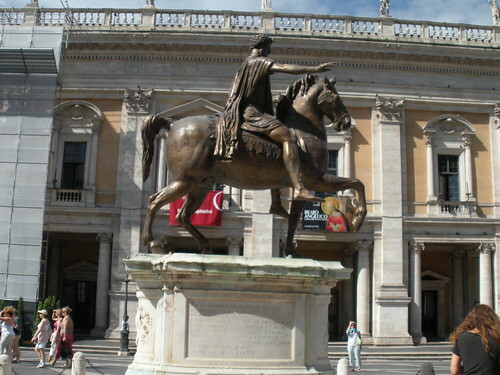 The Borghese Gallery was one of the best museums PJ and I visited while in Italy last month. We reserved a time on the last afternoon that we were in Rome, which turned out to be my birthday. Visiting this museum was a great way to spend the afternoon. One of the things I’ve learned about myself in the past few years is that I really enjoy house museums. 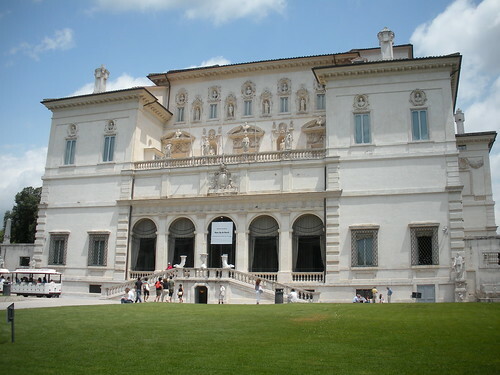 The Borghese Gallery is housed in a seventeenth-century villa owned by the Borgheses, one of Rome’s wealthiest and most powerful families at this time. 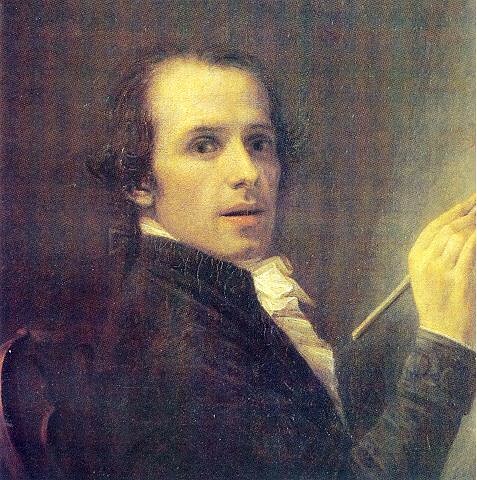 The family moved to Rome in 1541 and came to the fore of Roman society when Camillo Borghese was elected pope in 1605. 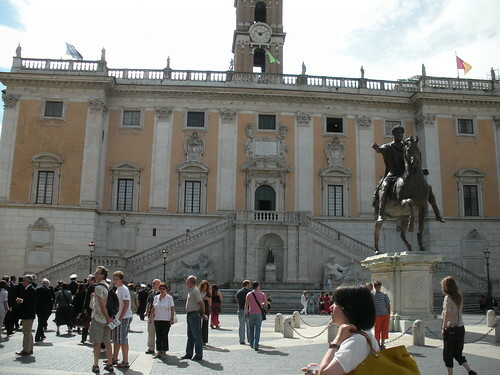 He took the name Pope Paul V. Construction of the villa began in 1612 and was completed in 1620. It’s an amazing house, and the collection is equally impressive. The highlight of the collection for me was Bernini’s Apollo and Daphne, which was completed in 1625. This was one of the most impressive sculptures I saw during our trip to Italy. It is an amazing piece of art, especially in its intricate details and complexity. The myth that this piece depicts is the moment that Daphne prays to the gods to deliver her from the pursuit of Apollo. Apollo had offended Eros, so the god of love shot him with a golden arrow, causing him to fall in love with Daphne. But Eros shot Daphne with a lead arrow, causing her to hate her pursuer. When Apollo was just about to catch the woman of his affections, she cried out to her father, a river god, to deliver her. 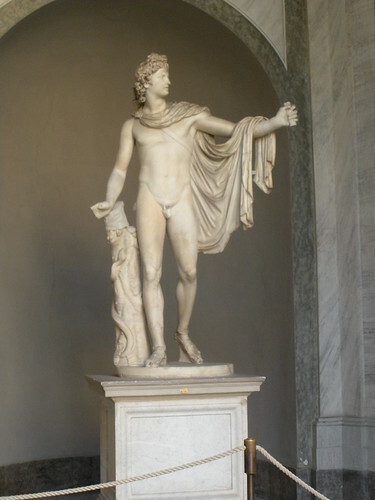 In order to do so, he transformed her into a laurel tree, which Apollo took as his official tree from then on. Bernini’s statue captures the moment in which Daphne is transformed. In his statue, she is part human and part tree. Her fingers are sprouting leaves and her feet are taking root into the ground. Part of what stands out about this work is the delicacy of the leaves and roots, which contrast with Apollo’s movement. Her movement is one of transformation into statis, while his is still moving toward her. It’s an amazing accomplishment. While we were in Rome, PJ and I visited the Vatican Museums and St. Peter’s Basilica. I’m not quite sure now what I expected. Gold plated everything, I’m sure. I knew that the Vatican has an unparalleled art collection, but it was hard to imagine how a religious institution is also a museum. I’m not nor have I ever been a Catholic. I do love following papal successions, though the only one so far that I’ve actually followed live is Pope Benedict’s ascension to the papacy. During that process, I read as much as I could about popes and conclaves and the history of each. As a side note, I have to say that I expected a great quantity and a much greater quality of scholarship on these topics than I actually found. Maybe I just didn’t look hard enough, but what I found wasn’t very good. Are historians not going into papal history anymore? We decided to visit the Vatican on Wednesday morning. We read that it’s easier to get into the museum during the Pope’s weekly audiences, which turned out to be true. We practically just walked right in. This is part of the Vatican’s collection of Egyptian artifacts, but it seems like a really bizarre way to start visitors through the collection. If I were in charge, I think I would arrange the art and artifacts in a more religiously thematic way. Otherwise, the Vatican Museum ends up seeming just like any other museum, which seems fine to me, but I would think that the Church would want to use it for more religious purposes. But I guess not! What sounds out to me about this statue is that is demonstrates that not all of the men have been covered with fig leaves (though this one’s lost his manhood over time!). Rick Steve’s Guide to Rome points out that all of the fig leaves could be removed at any time, since they’re just plastered on. He suggests that patrons suggest that the Vatican remove the remaining ones. While PJ and I were in Boston last month, I visited the Harvard Museum of Natural History. It’s attached to the Peabody Museum of Archaeology and Ethnology, so I visited both museums while PJ was attending his conference, the American Literature Association. Most of the museums I’ve visited in the past few years have been art or history museums. A few years ago I visited the Field Museum in Chicago, which was really impressive and interesting. I enjoyed that museum so much that I decided to check out these museums in Cambridge when I had a free morning to look around on my own. The HMNH is similar to the Field Museum in that it has several rooms of taxidermied animals to look at. I generally feel a little weird about these displays. On the one hand, they offer a relatively up close look at animals we would otherwise never get to see. On the other hand, it feels like a lot of animals died for what amounts to little more than idle curiosity. Having two adorable cats has definitely changed my mind about the expendability of animal life. The animals in this picture are hummingbirds. This case isn’t huge, but it’s the size of a large bookshelf. 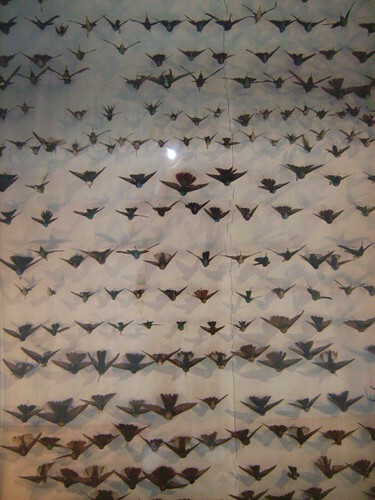 As you can see, there are rows and rows of hummingbirds of many different varieties. Being able to see these birds up close is really interesting. It’s hard to believe that there are this many species of hummingbirds in the world. One effect of a display like this is, ironically, to impress upon the viewer just how vast and diverse and full of life the world is. I left this museum feeling very small and insignificant in the vast scope of things.